If you want to experience a sparkling Italian mentality combined with great, affordable pizza, visit Luigi’s. The pizzeria is located in the Portugiesenviertel (Portuguese quarter) right at the harbor. 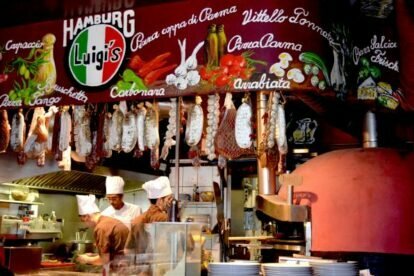 You will find lots of small, mainly Iberian and Italian restaurants in this area and Luigi’s is one of my favorites. The restaurant is packed full of small tables. The waiters live the Italian spirit and will always welcome you with a big smile and laughter. They love to make jokes and entertain their guests with little shows like flying dough or interesting pizza shapes. But probably the best part is Luigi’s authentic Italian food – typical appetizers like bruschetta, antipasti or carpaccio, stone baked pizza, variations of pasta and delicious desserts like tiramisu – the dishes are really tasty, very authentic and the servings are huge, so if you are not too hungry, you can easily share a pizza as well. For your birthday, they often celebrate it with a huge portion of tiramisu with sparklers on top and after dinner, they usually serve a little schnapps on the house as well. It is so popular, you usually have to wait for a table (even if you’ve made reservations). But don’t worry! They will serve you drinks like sparkling wine or Aperol Spritz for free as long as you have to wait! So be prepared for an evening full of fun, laughter and great food and enjoy la dolce vita at Luigi’s.